The town of Creston, with a population of 4,800, is located in the Kootenay region of southeastern British Columbia, near the United States border. The forests around the town contain the "Kootenay mix" that includes a wide variety of coniferous tree species such as western red cedar, western hemlock, western larch, Douglas-fir, lodgepole pine, ponderosa pine, western white pine, Engelmann spruce, grand fir, and subalpine fir. Location of the Creston Community Forest (green) within British Columbia. The Creston community forest is proving that community control can lead to peace and cooperation in the woods. Community control of the forests surrounding Creston signaled the culmination of 25 years of citizen opposition to logging in the domestic watersheds surrounding Creston. In the 1990s, some of the people who led the opposition to logging became the leaders who promoted a community forest in order to achieve their vision of ecosystem-based forestry for the watersheds. The Creston community forest was created in 1997 as a volume-based license with an allowable annual cut of 15,000 cubic meters per year over a 15 year period. In 2008, Creston was awarded an area-based Community Forest Agreement. The community forest comprises 12,800 hectares and includes the 8,500 hectare Arrow Creek watershed that provides water for the town of Creston, the many orchards in the area, and for the Columbia Brewing Company, producers of Kokanee beer. Sales of beer amount to $440 million dollars annually and the brewery employs many local people. The watershed is also an important recreation area and provides significant ungulate winter range. 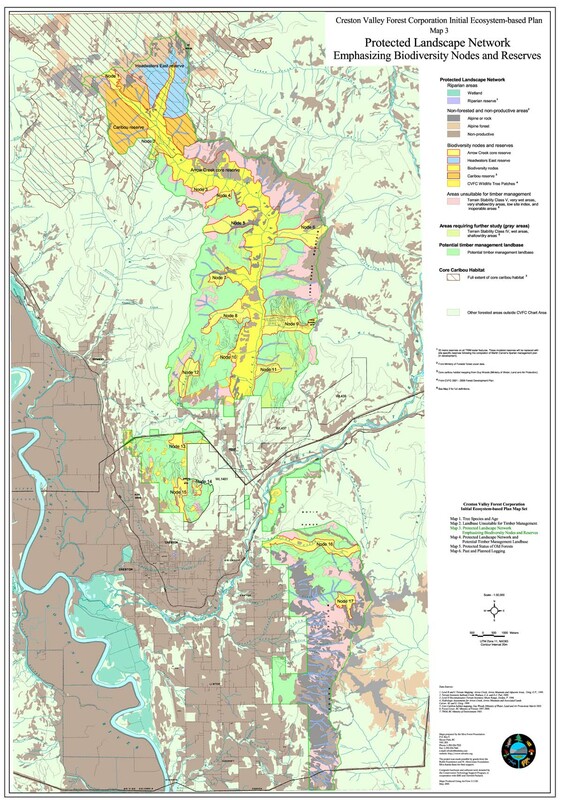 The Creston community forest is governed by a corporation made up of equal shareholders who represent the town of Creston, the Regional District of Central Kootenay, the Creston Area Economic Development Corporation, the Lower Kootenay Indian Band, and Wildsight. Each shareholder selects its representative to the Board, then the five shareholder directors choose an additional five directors annually from the community. The goals of the Creston Community Forest include implementing an ecosystem-based philosophy; protection of water quality, quantity, and timing of flow; and encouraging public participation. 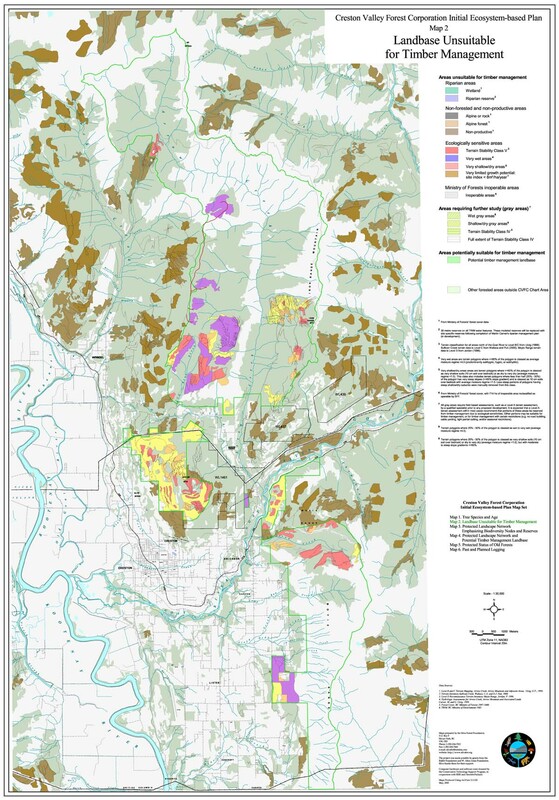 In 2002-2003, the Silva Forest Foundation worked with Jim Smith, forest manager of the Creston Community Forest, to prepare a set of ecosystem-based planning maps. Logging began three years prior, but the community corporation had not yet prepared an overall ecosystem-based plan for the entire landscape of the license area. The Protected Landscape Network will guide future logging activities so that wildlife habitat, water quality, and biodiversity are maintained across the community forest. The community forest has completed four years of ecosystem-based logging and has cut 85,000 cubic meters in 19 cutblocks, paying $1 million in stumpage to the provincial government. The community forest provides up to 25 part time jobs in the community and puts $1.5 million annually into the local economy. Restoration forestry is a strong component of the management of the community forest. Many parts of the forest are unnaturally overstocked due to fire suppression. Prescriptions are tailored to the site and consider a wide variety of variables. Single tree selection prescriptions log the worst and leave the best trees for the future. In group selections, openings are no more than 1½ to 2 tree lengths across, and shading from the edges ensures that snow does not all melt at the same time. The heaviest form of cutting is a shelterwood cut where 70% of the trees are taken, but the largest and healthiest trees are left and will never be cut. Creston is implementing leading-edge ecosystem-based planning and forestry and is showing that a diverse group of stakeholders can successfully take responsibility for what happens in the forests around them. Map 1: Tree Species and Age shows the current leading tree species and stand age class distribution in the Creston community forest, providing a good overview of the condition of the landscape. 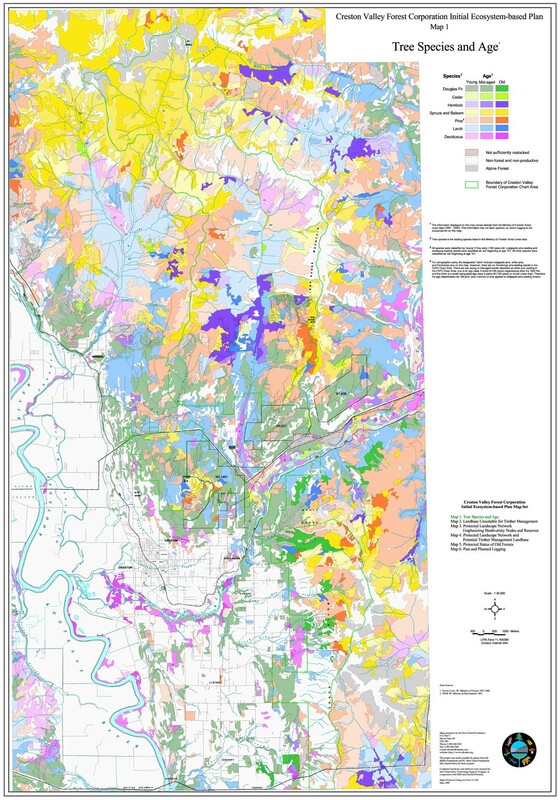 Map 2: Landbase Unsuitable for Timber Management identifies areas that are ecologically sensitive such as riparian reserves, areas that have very shallow soils and are very dry, areas that are very wet, and steep terrain. Other categories of land removed include alpine forests, areas of alpine or rock, and non-productive areas. 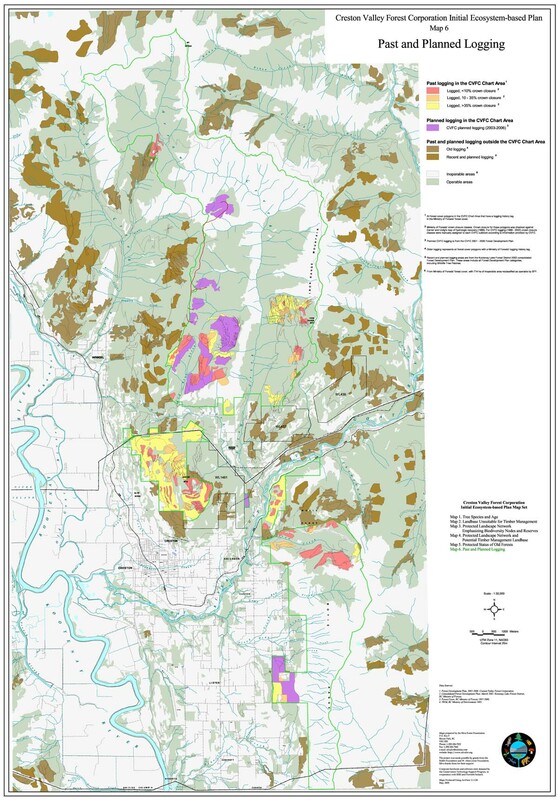 Map 3: Protected Landscape Network emphasizing biodiversity nodes and reserves, identifies the areas that need to be protected in order to maintain ecological integrity. The Protected Landscape Network (PLN) includes all areas that are ecologically sensitive, inoperable and non-productive (Map 2), and also includes biodiversity nodes and ecological reserves. Ecological reserves are relatively large (>500 ha) protected areas that encompass a wide spectrum of ecosystem types. 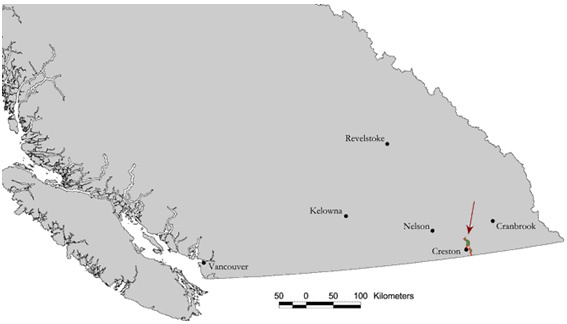 Reserves are designed to meet larger landscape objectives, like landscape-level connectivity and the maintenance of hydrological functions in the Arrow Creek watershed. Biodiversity nodes are smaller (10 to 250 ha) protected areas that are designed to include specific representative, ecologically sensitive, and unique forest areas. Nodes are often designed to include existing old forest (see Map 5). Nodes are designed to be well distributed across the landscape, and are often placed in key areas for connectivity. Seventeen biodiversity nodes were identified for the Creston community forest area. 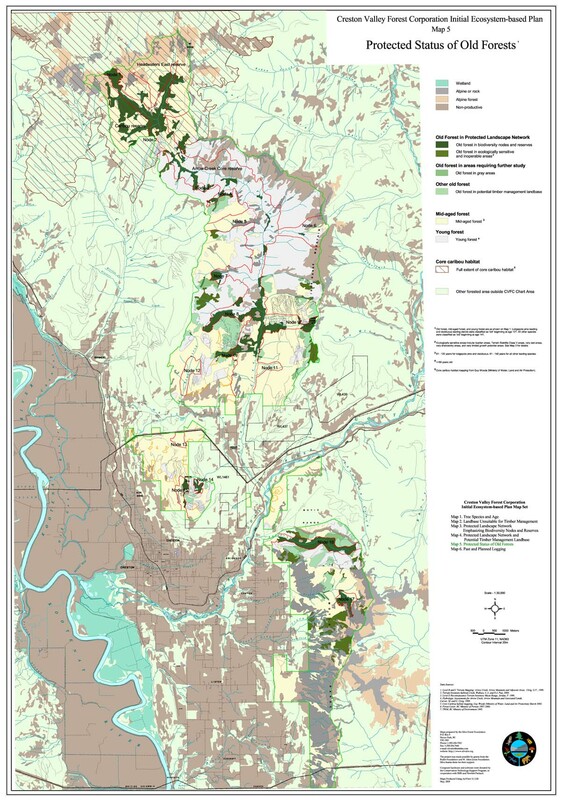 Map 4: Protected Landscape Network and Potential Timber Management Landbase combines the information from Maps 2 and 3 and shows those portions of biodiversity nodes and reserves that do not have ecological constraints to timber management. Map 5: Protected Status of Old Forest shows where and how much currently existing old forest is protected in the PLN. Current old forest area in the Creston community forest is likely at the lower end of the range of natural variability. For this reason it is important to protect most of the existing old forest until existing early and mid-seral stands are older. Many early and mid-seral stands are protected in the PLN and thus, over time, the total percentage of old forest in the Creston community forest will increase significantly. Map 6: Past and Planned Logging and Potential Timber Management Landbase shows the logging history of the community forest and areas planned for logging by the community forest. 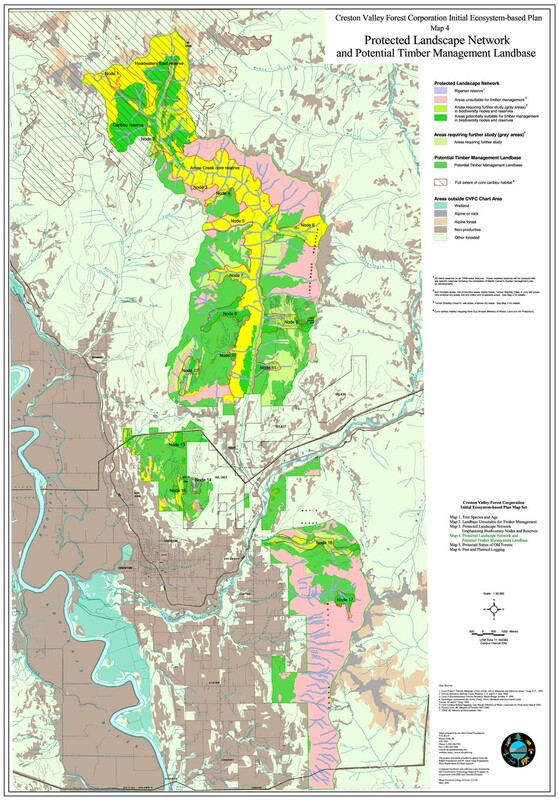 This map also shows recent and planned logging in areas adjacent to the community forest in order to provide a picture of the condition of the larger forest landscape.